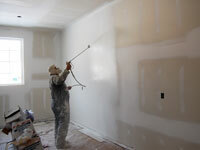 Image Drywall & Paint is a leading Alaska drywall contractor. Our workmanship is top quality and our process is fast, clean, and efficient. The following stages are typical for a normal sheetrock installation project. Our Alaska drywall contractor service has done work for quality builders, homeowners, and commercial drywall jobs throughout the Mat-Su Valley including Wasilla, Palmer as well as Eagle River and Anchorage. 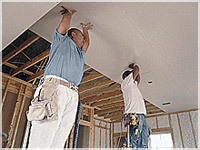 Our drywall crews also travel statewide when needed. Image Drywall & Paint handles every detail of the sheetrock contracting phase. This includes ordering the right amount of sheetrock and then picking it up and delivering it on-site. We then hand carry each sheet and distribute it throughout the building. Our sheet rock hanging crews are among the best in Alaska. They work fast, efficiently, and take pride in quality workmanship. Our crews take great care in keeping your job site clean. As a normal practice we cover all floor areas with paper and masking to ensure easy clean up. When the job is finished our crews completely broom clean the floors and haul off material scraps. Once the drywall hangers are finished our tapers start right in on the job. The taping phase goes quickly and smoothly because we use crews that have worked together for over 10 years. The next step is to apply primer to seal the drywall and make it ready for texture and paint. Once the primer is dry it is time for the texture to be applied. 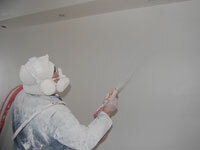 Image Drywall & Paint contractors are among the most skilled Alaska drywall texture specialists. We can apply texture in all of the standard patterns of application as well as customized texture patterns that make your home truly one of a kind. Review the pictures below to get an idea of some of the texture patterns we commonly apply. If you don't see something you like just ask us and we can customize a pattern just for you. © 2005-2010 J J Enterprises Inc. dba; Image Drywall & Paint . All rights reserved. No portion of this website may be used or reproduced without the expressed written permission.